It’s not often that we find an ancestor in the Federal Penitentiary, but for the lucky family historian that has one, the records and documents kept during their stay in the “federal home” are plentiful. These records are genealogically rich and can be used not just to uncover their history, but they may connect the researcher to other family members. As the expert speaker at the Kansas City NARA, Steve Spence, says “A warning comes with this information. 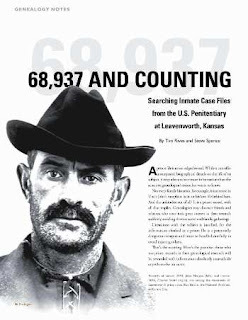 This is raw unedited information, so be sure you want to uncover the truth.” There are 69, 937 plus case files for the US Penitentiary Leavenworth Inmate records from 1895-1952. These are primarily textural records. From these files you can learn about your ancestor’s lot in life, and get enlightened in US history. In addition to Leavenworth, records were preserved for Alcatraz, Atlanta and McNeil Island. These textural records are held at the Regional Archives. For information on the NARA holdings reference Research On Prison at the National Archives. During the Feb. 28th workshop at the Kansas City NARA, I had an internal battle on which record I would delve into first. So, I’ve opted to just present the various records to you, as the speaker gave them to the captivated audience. 1) Mug Shot - These pics are not blurred, and the person in them are definitely identified. What genealogists wouldn’t want to say that for the stack of unmarked photos on the desk? 2) Record Sheet -To include name, crime, violation (some surprisingly minor) and dates. Really? Uncle WhatsHisFace killed someone even in prison? 3) Personal Data Sheet - Birth, education and religion. But the best part, that coveted genealogical information of spouse and parent’s name. For this reason alone, I wish most of my ancestors to be hard Federal criminals. At this point I must give a bit more of a historical lesson. Prior to fingerprinting a precise measurement of forehead, nose, etc. was used to identify prisoners (Bertillon Measurements). But then along came the West twins in 1903: Will and William West. (I know not creative but it is true according to various sources. Check out news article Rare Twin Murder Case Echoes Bizarre Fingerprint Origins. Their measurements were almost identical, but the only differentiating characteristic was their fingerprints. This led to abandoning the Bertillon measurement systems in 1904; replacing it with fingerprinting. These are the kind of stories that keep me up at night. Thanks NARA Steve for sharing. 5) Daily Work Record -Wouldn’t we all want to know what our ancestors’ daily life consisted of. This record gives us a glimpse of how they spent their time on a daily basis. 7) Correspondence Log -These records may hold the post office and state of correspondence. This kind of information may assist a researcher to a family’s whereabouts. 8) Personal Correspondence - Although letters were considered private property of inmates, they may have been confiscated and preserved due to a violation. Imagine what could be gleaned from these letters! 9) Trusty Prisoner’s Agreement - Perhaps your ancestor was remorseful and on the mends. He may have been allowed to work outside the walls or in a low level job inside. That might give a happy closure to those sleepless nights. 10) Sentence of Court Case -We all have used court cases to further our research and you definitely wouldn’t want to disregard this one. Although we don’t think of Leavenworth Penitentiary as being co-ed, it was for a short period. I don't think it took a Rocket Scientist to quickly figure out that was a bad a idea. So far it appears most of my ancestors have stayed on the right side of the law. There's even a few judges and magistrates in the family tree. I have to admit, though, that I almost wish I had a bad boy in my tree just so I could get my hands on their records. Thanks for the information. I just found out today that my maternal grandfather was a prisoner at Leavenworth from October 23, 1929 through November 12, 1930. He was sentenced for bootlegging during Prohibition. I've requested his prison file and am waiting impatiently for it to arrive in the mail. I'm excited but nervous! Do I really want to know what's in that file?? Maybe, maybe not. J. Green, Of course you want to know. I'm really happy you found this information and information on you grandfather. You must let us know what you find out. I think the "black sheep" brings us a bit of excitement in our family search! We have a missing relative presumed dead in 1918 whose name shows up on the Leavenworth index in 1918 on Ancestry.com. I've emailed asking for his file. How much should I expect to pay for these records? Thanks for the info. I have a 'black sheep' in my family as well who was incarcerated at Leavenworth in 1935. My grandmother remembers his crime as counterfeiting and said he was, "no good." I will be contacting NARA. Hello: My ex, may he rest in peace, was on McNeil Island during 1975. I remember visiting him, first driving to Steilacoom, then catching the boat to the Island. I have his letters and his number and I was wondering how I would be able to access his file. Thank you very much.